MediaCityUK is a 200-acre (81 ha) mixed-use property development site on the banks of the Manchester Ship Canal in Salford and Trafford, Greater Manchester, England. The project is being developed by Peel Media, and its principal tenants are media organisations and the University of Salford. The land occupied by the development was part of the Port of Manchester and Manchester Docks. The BBC signalled its intention to move jobs to Manchester in 2004, and the Salford Quays site was chosen in 2006. The Peel Group was granted planning permission to develop the site in 2007, and construction of the development, with its own energy generation plant and communications network, began the same year. Based in Quay House, the principal tenant is the BBC, whose move marks a large-scale decentralisation from London. ITV Granada completed the first phase of its move to MediaCityUK on 25 March 2013, followed in two stages by the northern arm of ITV Studios: the second stage involved Coronation Street being moved to a new production facility on Trafford Wharf (next to the Imperial War Museum North) at the end of 2013. The Studios on Broadway houses seven high-definition studios, claimed to be the largest such facility in Europe. MediaCityUK is to be developed in two phases. The 36-acre (15 ha) first phase was completed in 2011, and the second is dependent on its success. Metrolink, Greater Manchester's light-rail system, was extended to MediaCityUK with the opening of the MediaCityUK tram stop on 20 September 2010 and further extensions are planned. Road access was improved by the construction of Broadway Link Road. Salford Quays, at the eastern end of the Manchester Ship Canal on the site of the former Manchester Docks, became one of the first and largest urban regeneration projects in the United Kingdom after the closure of the dockyards in 1982. It forms part of an area known as The Quays, a joint tourism initiative between Salford City Council and Trafford Borough Council, which also encompasses Trafford Wharf and Old Trafford, on the Manchester side of the ship canal. As well as Salford Quays, The Quays development includes The Lowry Arts Centre and the Imperial War Museum North. A total of 200 acres (81 ha) of land have been earmarked for the development of MediaCityUK. The first phase of MediaCityUK's development was primarily focused on a 36-acre (15 ha) site at Pier 9 of Salford Quays. In 2010 it was announced that an ITV production centre would be built on Trafford Wharf in the Metropolitan Borough of Trafford. In 2003 reports emerged that, as part of the plans for the renewal of its Royal Charter, the BBC was considering moving whole channels or strands of production from London to Manchester. Early discussions involved a plan where the BBC would move to a new media village proposed by Granada Television at its Bonded Warehouse site at Granada Studios in the city. 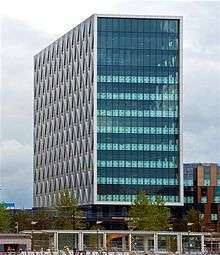 Proposals to relocate 1,800 jobs to Manchester were unveiled by BBC Director General, Mark Thompson, in December 2004. The BBC justified the move as its spending per head was low in northern England where it had low approval ratings and its facilities at New Broadcasting House in Manchester needed replacing. An initial list of 18 sites was narrowed to a short-list of four during 2005, two in Manchester – one at Quay Street, close to Granada Studios, and one on Whitworth Street and two in Salford – one close to the Manchester Arena and one at Pier 9 on Salford Quays. The site at Salford Quays was chosen in June 2006 and the move north was conditional on a satisfactory licence fee settlement from the government. The chosen site was the last undeveloped site at Manchester Docks, an area that had been subject to considerable investment and was emerging as a tourist destination, residential and commercial centre. The vision of the developers Peel Group, Salford City Council, the Central Salford Urban Regeneration Company and the Northwest Regional Development Agency was to create a significant new media city capable of competing on a global scale with developments in Copenhagen and Singapore. Salford City Council granted planning consent for an outline application for a multi-use development on the site involving residential, retail and studio and office space in October 2006 and consent for a detailed planning application followed in May 2007. In the same month the BBC Trust approved moving five London-based departments to the development. The departments to be moved were Sport, Children's, Learning, Future Media and Technology and Radio Five Live. 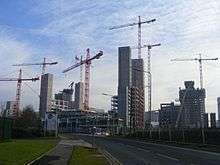 Construction started in 2007 with the site owner, Peel Group as developer and Bovis Lend Lease as contractor. The media facilities opened in stages from 2007. The first facility being the Pie Factory, which was located in a refurbished bakery. It featured three large sound stages suitable for drama productions and commercials. In January 2011 Peel Media received planning permission to convert on-site offices used by Bovis Lend Lease during the construction of the first phase into the Greenhouse. The first trial show took place in November 2010 in Studio HQ2. The half-hour test show featured a power failure and a fire drill, which involved a full evacuation of the audience and crew. The first programme filmed at MediaCityUK was Don't Scare the Hare in February 2011, and the first to transfer was A Question of Sport, the same month. BBC employees started transferring to the development in May 2011, a process that took 36 weeks. BBC Director General Mark Thompson confirmed that up to a further 1,000 jobs could be created or transferred to the site. In January 2012 the BBC was accused of not supporting the community by MP, Hazel Blears, after it was reported that only 26 of 680 jobs created at the development had gone to residents of Salford. Channel 4 has expressed an interest in moving some activities to MediaCityUK. The BBC has stated that either BBC One or BBC Two could move to MediaCityUK by 2015 if the confirmed moves are successful. Traditional street names are not used in the development. The main thoroughfares are styled blue, white, pink, yellow, orange, purple and green where street furniture and coloured ambient lighting will be colour-coded to match. A stylised map of the site has been devised. Landscape architects, Gillespies regenerated the brownfield site to create public spaces. The focal point is a piazza and landscaped park, which stretches to the ship canal around which the buildings are located. The piazza's two distinct areas, The Green and The Stage are capable of holding events for up to 6500 people. In front of The Studios there is a free-standing big screen, which is viewable from the piazza. The BBC occupy three buildings: Bridge House, Dock House, and Quay House, all designed by architects Wilkinson Eyre. With simple forms intended to harmonise with their waterfront settings, the buildings provide 450,000 square feet (42,000 m2) of accommodation with the BBC occupying 330,000 square feet (31,000 m2) of office space. Quay House is the BBC's 135,000-square-foot (12,500 m2) main building from where BBC Breakfast, Match of the Day, BBC Radio 5 Live, North West Tonight and BBC Radio Manchester are broadcast. Bridge House is where Blue Peter, Mastermind, Dragons' Den, CBBC, and BBC Bitesize are produced. Dock House contains the BBC's Research & Development and Religion & Ethics departments. In November 2011 BBC Radio 6 Music teams moved from New Broadcasting House into Dock House, where some programmes for BBC Radio 4 are made. The Orange Tower is an 11-storey building, designed by architects Sheppard Robson. It is a glazed structure with four types of cladding, including one made of folded aluminium in a diamond pattern. It houses departments from the University of Salford on three floors and on seven floors, staff from ITV Granada. The Studios on Broadway, contains seven high-definition studios, claimed by Peel Media to be the largest such facility in Europe. The largest studio has an area of 12,500 square feet (1,160 m2), making it one of the biggest in western Europe. Fitting began in 2010 at a cost of £22 million, in time for the BBC's move in summer 2011. The seven studios vary in size; the large studios are on the ground floor, and the smaller studios on the first floor. The larger of the two audio studios, sitting on hydraulic jacks to insulate it from noise generated in the surrounding studios, is dedicated to the BBC Philharmonic Orchestra. The studio block contains offices and the glass-fronted, 16-storey Holiday Inn hotel. The Greenhouse designed by architects Stephenson Bell, is a refurbished three-storey office block that has been converted into small, flexible office suites for small companies in the media and creative industries. 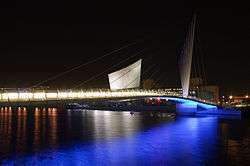 The MediaCityUK footbridge at Salford Quays illuminated at night. The Imperial War Museum North is seen in the background. The opening swing footbridge at Salford Quays links MediaCityUK with Trafford Wharf on the southern bank of the ship canal. It was designed by Wilkinson Eyre in association with Gifford. The bridge's main span is 213 feet (65 m) when open and provides a 157-foot (48 m) wide navigation channel accommodating ships' superstructures up to 66 feet (20 m) in height. The developers specified it to be "a unique and memorable landmark". Its visibility is created by a curved bridge deck with an offset pivot mast and array of supporting cables in a fan or sail shape. It has seating benches and is lit at night. The bridge, constructed with funding from the Northwest Regional Development Agency, is the final link in a circular walking route connecting the development with The Lowry and Imperial War Museum North. It was officially opened by Rowan Williams and John Sentamu, the Archbishops of Canterbury and York, and was opened to the public in May 2011 after landscaping works were completed. The architecture at MediaCity has been criticised by the editor of Building Design magazine Ellis Woodman, who describes it as "a crazed accumulation of development in which every aimlessly gesticulating building sports at least three different cladding treatments. The overriding sense is one of extreme anxiety on the part of the architect. Quite how the BBC has stooped this low is hard to fathom." The development was awarded the Carbuncle Cup by Building Design for the worst new building in 2011. Owen Hatherley writing in The Guardian criticised the development as "an enclave, easily closed off from the life of the rest of the city". Approximately 2,300 BBC staff are employed at MediaCity. In July 2010 it was announced that the BBC Breakfast programme would move to Salford Quays. It is claimed that the development will create up to 10,000 jobs and add £1bn to the regional economy over 5 years. 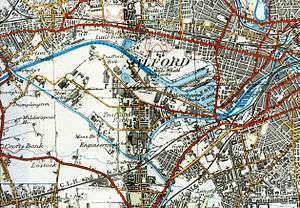 In 2009 the BBC estimated that moving to Salford would cost nearly £1 billion spread over twenty years. but in May 2011, Director General Mark Thompson claimed the cost of moving was much less. BBC North is one of eight national business divisions of the BBC based here, that includes the following BBC departments, BBC Breakfast, CBBC, CBeebies, BBC Radio 5 Live, BBC Research, BBC Sport, BBC Learning and the BBC Philharmonic. BBC North West has also relocated to the site. The Orange building houses the University of Salford campus and ITV Granada. ITV Granada was interested in relocating but negotiations with the developers, Peel Media, were abandoned in 2009 amid a financial dispute. After a change of management at ITV Granada, talks resumed in January 2010 and in December the decision to move to MediaCityUK was announced. A production facility was constructed on Trafford Wharf to house the Coronation Street sets that transferred from Granada Studios in 2013. In March 2013, Granada Reports was broadcast from MediaCityUK signifying the completion of the initial phase of its migration from the Granada Studios in Quay Street. Satellite Information Services (SIS) has occupied an office at The Pie Factory since 2006 and in 2010 formed a joint venture with Peel to manage the studios. In 2011 SIS announced it would move its headquarters from London and awarded a £3 million contract to S3 Satcom and SATCOM Technologies for the provision of a nine earth station broadcast teleport on Trafford Wharf. SIS announced the launch of its teleport in July 2012 and opened offices in the Blue Tower a month later. The University of Salford moved its media-related teaching and research to the MediaCityUK site in October 2011. The move will controversially cost the university more than £2.25 million in rent per annum until 2020. A diverse mix of about 40 service companies, along with small companies offering ancillary services such as casting and camera hire, occupy The Pie Factory and The Greenhouse. Antix Productions moved into offices in The Greenhouse in 2011. In 2012 the Rugby Football League opened an office in The Greenhouse to facilitate the administration of the 2013 Rugby League World Cup. In 2008, Hope High School in Salford was taken over by Oasis Community Learning, an evangelical Christian organisation, and renamed Oasis Academy MediaCityUK; its new premises in Salford Quays, on the edge of the MediaCity UK site, were completed in September 2012. UTC@MediaCityUK, a University Technical College backed by the University of Salford, The Lowry and the Aldridge Foundation, specialising in the creative, media and music industries opened in 2015. 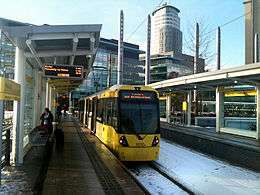 The MediaCityUK tram stop opened on 20 September 2010, part of the Metrolink light-rail system serving Greater Manchester. It lies at the end of a 360-metre (0.22 mi) spur from the Eccles Line, which was built as part of Phase 3 of the Metrolink expansion project. Trams run to Piccadilly via Harbour City and Cornbrook. Vehicular access to the Quays has been improved by the construction of Broadway Link Road, which links the site to the M602 motorway at junction 2, and by the provision of car parking. The high-rise 2116 space multi-storey car park was completed in August 2009. It is a pre-cast curved structure clad in a mixture of aluminium mesh panels and shaded aluminium tiles, comprising 11 floors of parking above the development's energy centre and commercial units. Stagecoach Manchester provides the high-frequency "City Connect" bus service linking MediaCityUK to East Didsbury, Manchester city centre, Salford Central and Salford Crescent railway stations, the University of Salford and Salford Shopping Centre. ↑ Pierce, Andrew; Bilsborough, Jack (7 August 2009). "BBC move from London to Salford could cost £1 billion". Telegraph Media Group. Retrieved 30 September 2010. ↑ "£190m - the real cost of BBC's Salford move". Manchester Confidential. 10 May 2011. Retrieved 2 April 2013. ↑ "University of Salford opens at MediaCityUK". BBC News. 4 October 2011. Retrieved 6 October 2011.